123RF is one well-established stock photo agency, with a solid library of stock images, very affordable prices and a great level of service. 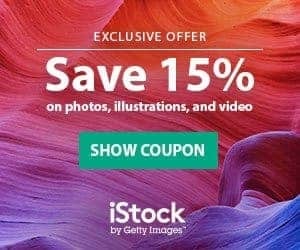 With over 10 years in business, this company is owned by traditional stock photography agency Inmagine, and it focuses in the Royalty Free, cheap stock photo market, offering varied buying options and flexible licensing terms that let you buy stock photos cheap without neglecting quality. In the years since their launch, 123RF has expanded their offer to include stock footage and stock audio, which add to their collection of over 65 Million stock photos and vectors. They also have a mobile app to let you search their library and create lightboxes, and their website includes several advanced tech tools like reverse image search and a free online photo editor. 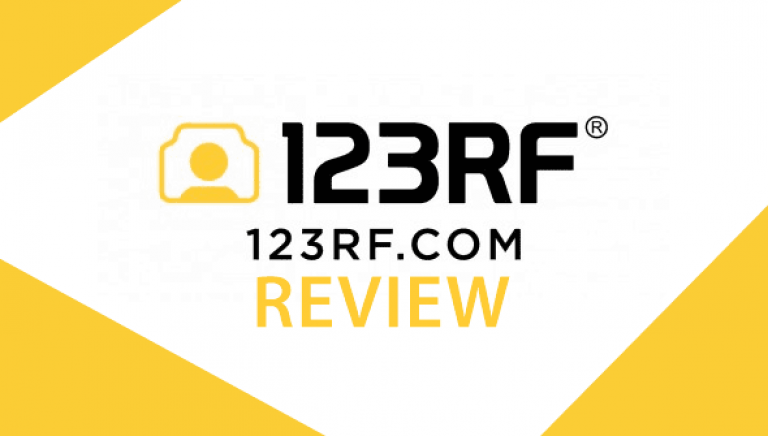 If you want to know all about 123RF's service, pricing, licensing and further details, walk with us through this dedicated review. If you want to check 123RF: sign up for free here! Don't miss our 123rf coupon code here! The company's name reflects the license type their business is based on: the “RF” in the name stands for Royalty Free. 123RF was born in 2005, founded by Inmagine founder Andy Sitt, and Stephanie Sitt, whom was CEO at this company until very recently: this year they announced Marko Oonk as the new CEO, giving the agency a new leadership and centering their efforts in expanding their reach in international markets. 123RF is already present in all continents, has over 200 employees and around 100,000 contributing photographers adding content to their library. 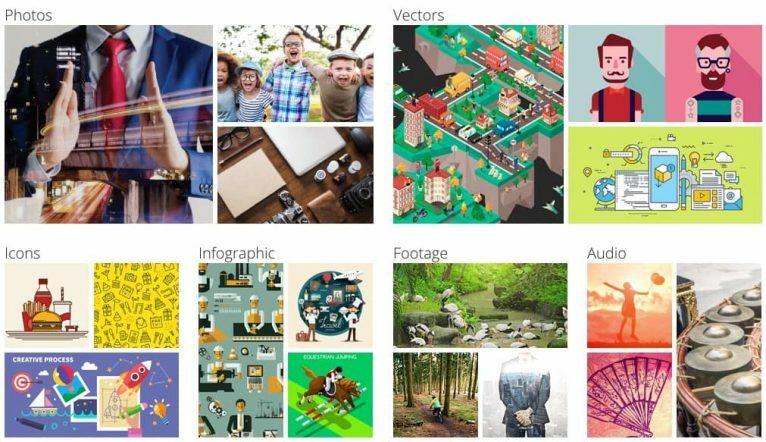 The agency has a library of over 65 Million stock photos and vector illustrations, and they add over 100,000 new images every day. 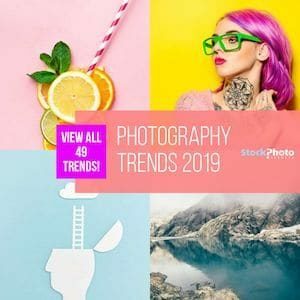 Arranged by categories of popular topics, this large collection of stock photos covers all kinds of themes and subjects, granting you will find what you are looking for. Moreover, all the images are checked for technical quality, and are available in different sizes for web and print usage, which ensures you will get the high quality images you need to create compelling and visually appealing designs. Best of all, all the images are inexpensive, and come with very convenient usage terms. But in order to buy these images, you need to acquire a credit pack. Credit packs start at $39 for 40 credits, and the larger the pack is, the less each credit costs –which means the more you pay upfront, the cheaper each image will be–. The minimum credit purchase is for 10 credits, at $13. 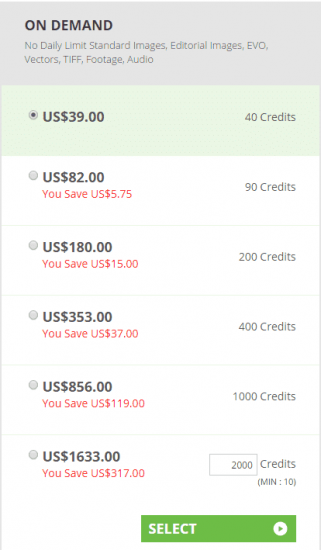 As you can see, larger credit packs apply a discount over regular credit price, lowering the final cost of an image. 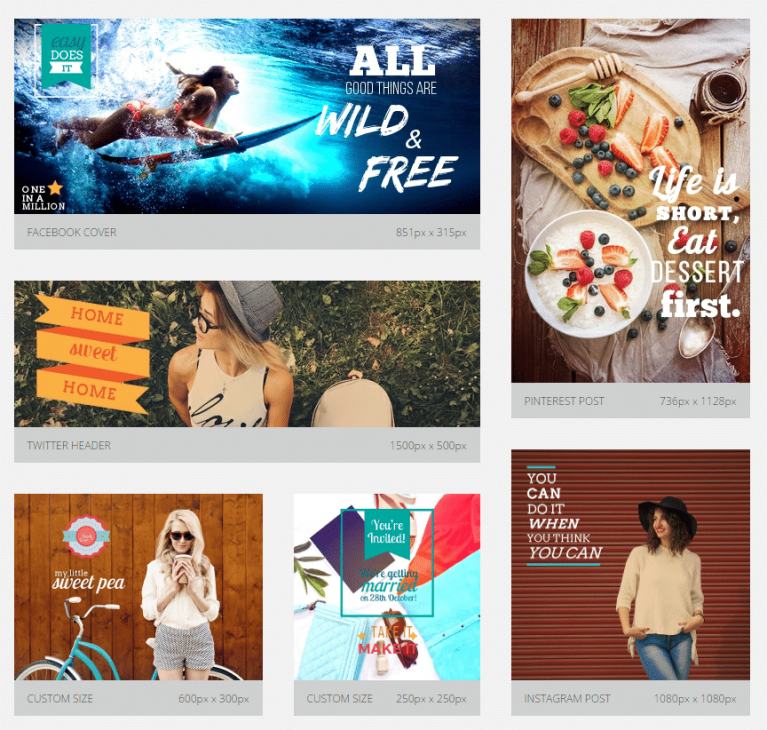 The largest pack for 1000 credits lets you save over $119 from regular price, and you would be paying as little as $0.85 for a small size image, and about $3.40 for a large one, making them one of the cheapest on demand stock photo offers in the market. They also have a custom credit purchase feature, that lets you buy as many credits as you wish, starting at 10 credits. With on demand credits you can buy any of 123RF media files: standard stock photos and vectors, EVO images (more on this below), TIFF, stock footage and stock audio, with either Royalty Free or Editorial standard license. Buy 123RF stock photos on demand, sign up for free now! When is it Best to Buy Stock Photos on Demand? 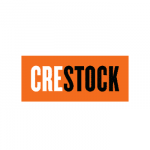 If you only need a handful of stock photos every now and then, if you never know exactly when you will need to download stock images, or if you want full control over how much you spend and where, buying on demand with credits is the most suitable option. The wisest thing to do, if your budget allows it, is to buy a large credit pack, as it gives you a better rate per credit and will let you get more images at lower price. Credits are valid for one year after purchase date, so you can stock your account with a large pack and then use them whenever you want within the following year. Otherwise, you can buy the pack that better fits your pocket. One way or the other, on demand credits are a great way to control your stock photo expenses fully: they are a one-time pay and you are not bound to periodic fees nor any further obligations with the agency, making them also a good choice to test the waters with the company before deciding on a subscription. Plus, if you want EVO premium content or you need an Extended license (all of which you'll learn about below), on demand credits are the only way you can buy them. 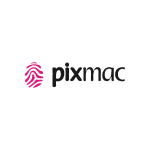 This agency also includes a way to buy large volume of photos constantly, at the best possible price. They have two types of stock photo subscriptions, based in how periodically the download limit updates, and both can be hired for one month and up to one year, where the annual option offers the lowest prices. 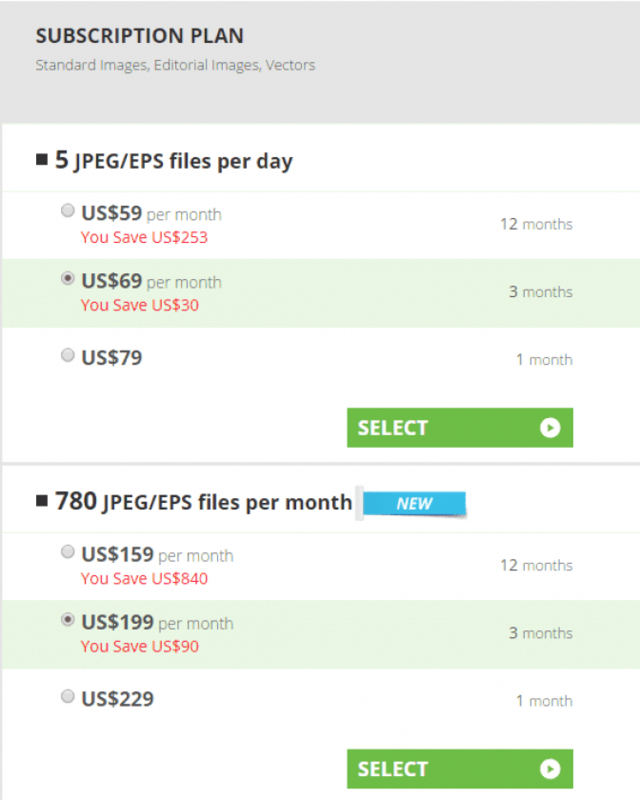 With this plan, you get a daily download limit of 5 images, that gets refreshed every day. You get 150 downloads a month, but limited to 5 images per day. The minimum you can hire this plan for is one month, but if you hire it for longer, you get a greater discount: with an annual plan, you'll be paying only $0.39 per image. However, if you want more flexibility in your download limits and you don't want to be restricted to a number of images per day (nor lose any unused downloads from day to day), there's another option for you: monthly download limit subscriptions. The monthly download limit is much more flexible as you are not bound to a number of downloads per day, you can download up to 780 images per month, whenever you want. This option also has the cheapest prices across all 123RF offer, and you can get stock images for as little as $0.24 each. 123RF subscriptions let you download standard images and vectors, with either Royalty Free or Editorial standard license, in JPEG or EPS format only. The downloads do not include TIFF nor EVO files, and footage and audio content is also excluded. Check out the 123RF subscriptions here. When is it Best to Buy a Stock Photo Subscription? If you need lots of stock images constantly, a stock photo subscription is the option that makes more sense, as it grants you the volume of photos you will need, and gives you the cheapest prices possible for them. Like this you can save a lot of money and rest assured you can access all the images you require. Within 123RF's library you will find the EVO label in some selected images, which is signaled with a crown icon on the image. EVO images are premium: they have a higher technical quality, and often also a higher production value. Plus, they are a bit more exclusive than the rest of the library's content, in the sense that their pricing tier and curation makes them to be less widely distributed and used. EVO images can be found using the collection filter in their search engine, which lets you display results from EVO label only. You can buy these photos and vectors only with on demand credits (not with subscriptions), and they are priced at a higher level than standard content. Extended licenses are also available for EVO files, also at a different price range, as you will see below. Corporate materials: Multimedia presentations, corporate videos, printed documents such as mailers, letterheads, etc. Artwork for personal use: Screensavers, etc. These are just some of the uses covered by Standard license, and they all come at a one-time fee. It's a very flexible and affordable license, that gives you a wide variety of usage rights, with no time limits nor geographic restrictions, and allowing use of the same image in multiple projects, simultaneous or over time. When Do I Need a Standard Royalty Free License? If you are going to use the images for commercial or for-profit related projects, but you will not be reselling the final work to others, then the Standard Royalty Free license will cover your needs. Keep in mind that the restriction of “Products for resale” refers to a serial redistribution of the same final work –like in t-shirts, mugs, greeting cards, etc–. If you are a graphic designer, a marketer or similar, and you buy stock photos for a project you're being paid to design, or that you'll sell to one final customer, the Standard Royalty Free license serves to your purpose. 123RF also has an Editorial Use license available, which lets you acquire usage rights for images that cannot be used commercially (mainly because the model and property releases needed have not been cleared). It's important to know that Standard license limits use to 500,000 copies. And the most important to know is that with Editorial license you may use the images for editorial purposes only. Any commercial use is a direct violation of the licensing terms. However it's still a very flexible deal, as it has no time nor geographic limitations, and you can use the image as many times as you want, in as many placements as you want. When Do I need an Editorial License? If you're a publisher and you want to use images to illustrate your articles, the Editorial license is perfect for you. Particularly if you are after photos of celebrities, popular entertainment or sports evens, or any other public interest related topic: famous people normally do not cede rights to use their likeliness commercially, and the same goes for the owners and managers of renowned events, so images like that are often only available under Editorial license. You must always keep in mind you cannot use these images in any way related to commercial purposes, and that if you need to print or distribute more than 500,000 copies you will need an Extended license. The agency also enables different Extended licenses that grant you specific usage rights that are not included in Standard license. Mainly, the right to use stock photos in products for resale. 123RF sells different Extended rights separately, according to the nature and medium of the intended use. Multi-seat License: Adds the right to give more than one user access to the same account, to download or view the downloaded images. This license is sold as an add-on, and you must purchase either a Standard or one of the Extended licenses to further add Multi-seat. 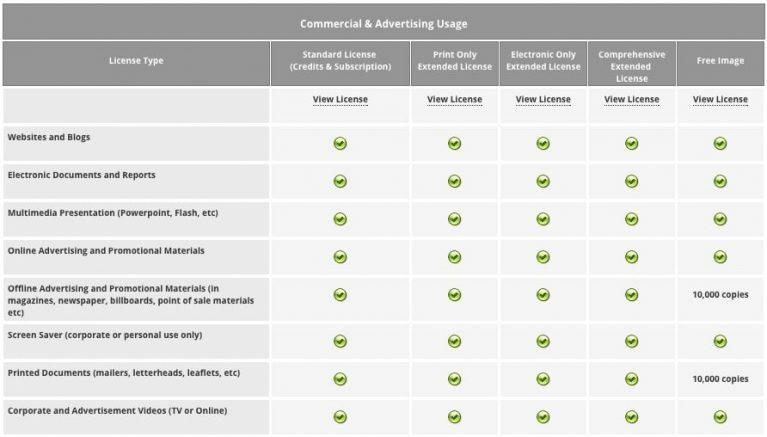 Of course, the final price for each of these licensing options depends entirely on the credit pack you buy. When Do I Need an Extended License? Essentially, every time you intend to resale or redistribute items containing a stock photo. A t-shirt design you want to sell, the packaging of the product you commercialize, a website template you created, a greeting card you came up with… anything you are intending to sell or redistribute at large scale (or to more than one end customer) will require an Extended license. In the case of Editorial use, if you want to make more than 500,000 copies of the article or publication where you used the image, you will also need a Print Only Extended license that removes this print run limit. 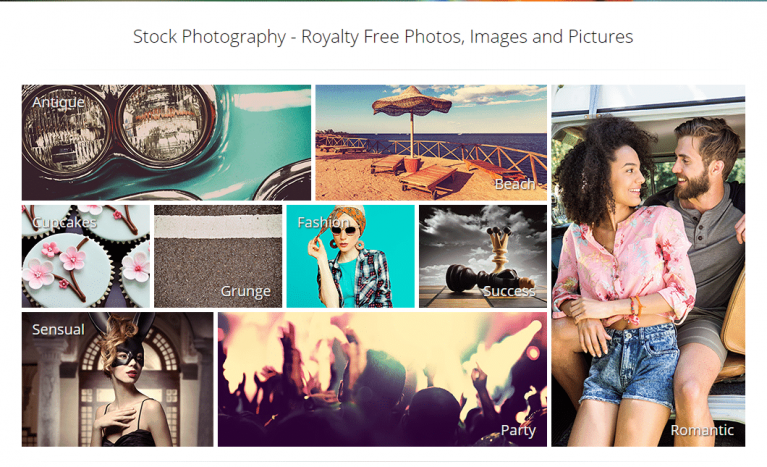 123Rf has a gallery of free stock photos you can download and use completely free of charge. Their free image usage terms allows to use the photos commercially, in both print and digital format (in the case of print there's a limit of 10,000 copies). The free image collection currently has over 50,000 files available. All files have an expiration period after which they are removed from the gallery (but they remain yours to use forever as long as you download them before they expire). This is a great way to test the waters with the agency, exploring the quality of their content and how well it can work for your needs, without spending a penny. They include selections of free digital arts and free stock audio as well. 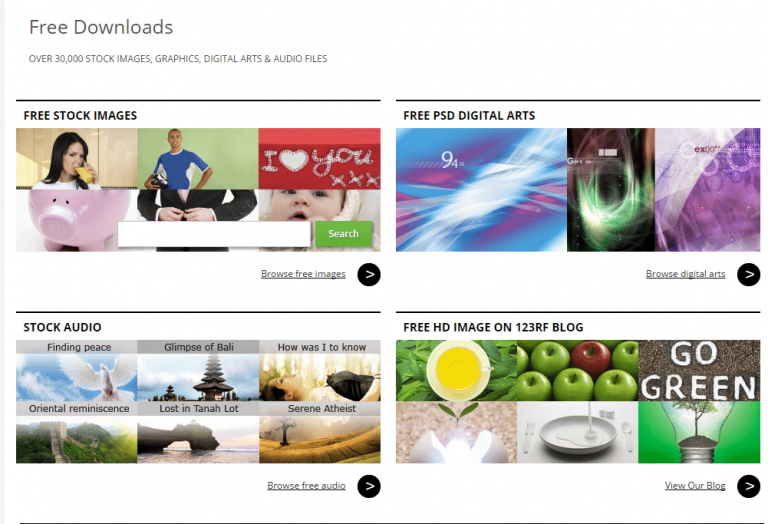 We have covered here how to download 123rf images free. One of the best features in 123RF's website is their search engine tool, which includes advanced functionality. Not only it lets you search for content by keywords, and further refine by media type. You can also choose to display results by relevance, variety, freshness and popularity, you can view all images or select photos or vector illustrations, and also filter by image orientation. Even more, you have a series of advanced filters that you can use to find results by collection (including EVO), according to when they were added, the number of people depicted, and there's even a color filter. And there's even more. 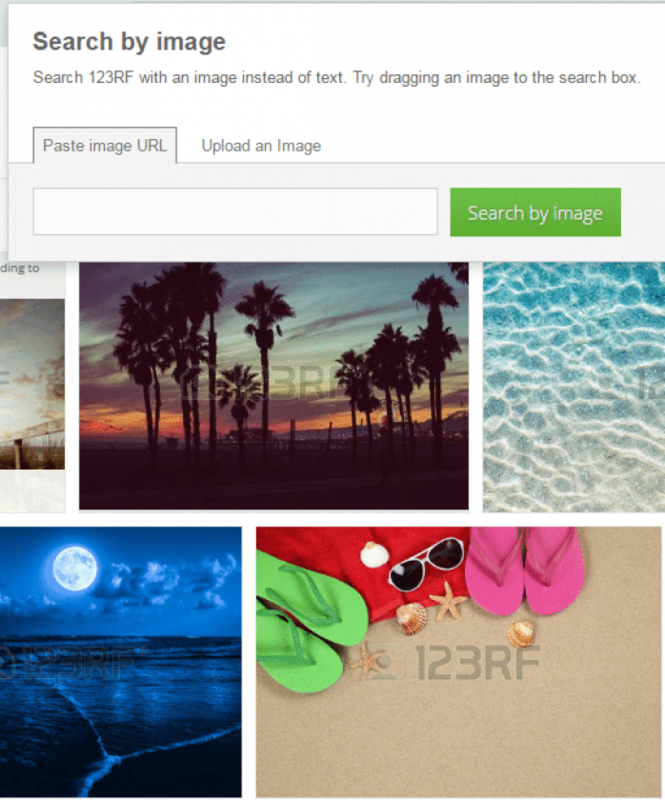 123RF now has a reverse image search function, that lets you find images using other image as reference. You can either upload an image file or submit the image's URL, and the system will show you photos from the agency's library that match the one you provided. Like this, you can find licensable images that are similar to one you saw and liked, and alternative images to one you already have, for variety. It also saves you the effort of describing what you are looking for with keywords, simplifying the process. 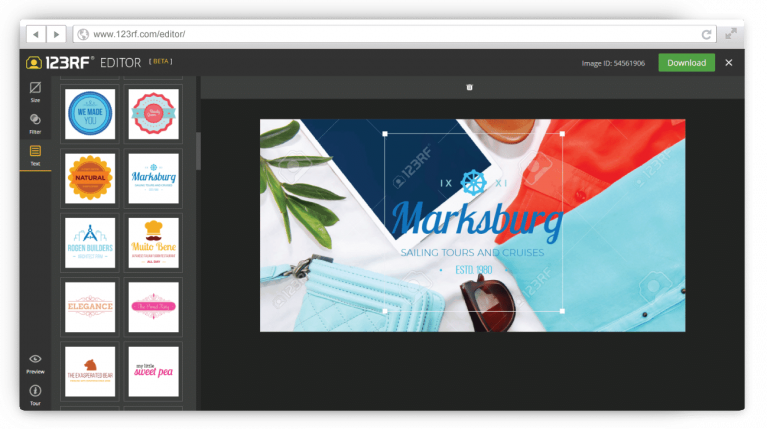 Another cool feature in 123RF is their free online photo editing tool. It's a very simple and effective way to create visuals for your social media or similar purposes, and it's very quick and user-friendly. All you have to do is select an image you want to edit, and choose a size for your new visual. You can select one of the preset sizes for social media channels, or enter your own, custom size. Next you can use a series of filters to get the right mood and final looks for your image, and add copy using a selection of preset text or creating your own. Last, you can download your finished image to get the final, unwatermarked file. If you're a smartphone user, you'll be glad to know 122RF is also in the app world. Their app 123RF Stock Photo lets you access your account and browse or search their library for compelling content. You can also create and manage your lightboxes, adding and saving images that catch your eye, to further license them on desktop. Their mobile platform is complete with a contributor-oriented app that helps photographers submit their images to 123RF and monitor their accounts from phone. Most agencies offer custom services for corporate clients, but 123RF enables a whole platform, Corporate+, for their big-business customers. In Corporate+ you access to discount rates, premium features, tailored licenses and workflow streamlining at no extra fees (you only pay for the content you license). This system lets you control which users are added to your corporate account, and how they can interact with the stock images from 123RF's library. If you have a big company, work with a large designers' team, or both, you will find a lot of value in this service, as it lets you collaborate and streamline graphic designing with one stock photo account, all in one place. Overall, 123RF has a very user-friendly website, which does all it can to provide clear and concise information as well as a simple and easy-to-use system to browse, search and license stock photos. The site includes very detailed and extended FAQ's –they even have a dedicated FAQ for EVO images–, and they have a very good customer support performance. This grants that you will have help in understanding all the details in their service, their offer and their licensing terms, and you'll be able to make thoughtful decisions about what images to download, with which license, and under which buying model. The future of the company is signed by international expansion, particularly into the Asian market. 123RF is already a global company, with offices all around the world in key regional markets and serving customers from a wide array of countries. However, it's clear that they are now more strongly focused in global expansion: they have recently appointed their former Director of UK division, Marko Oonk, as the new CEO of the company. Oonk has joined the company's offices in Kuala Lumpur, and his main leadership goals are centered in achieving a greater presence in Asian market, as well as deeply penetrating international markets in general. According to their plans, we can expect 123RF to be every day more global, bringing fresh images from all over the world for you to license and use in a few simple steps, and for very low prices. If you are looking for cheap stock photos that are also high quality and suitable for multiple uses in commerce and editorial publishing, if you want variety and a robust customer service, if you want low prices and flexible buying options… then 123RF is certainly one agency worth considering. Sign up for free at 123RF today and start downloading great stock photos for your designs!